While much thought is put into how to house and feed and clothe people who are displaced from their homes due to conflict, persecution or human rights violations, the world’s estimated 60 million refugees may also need at least 2.78 million surgeries a year, researchers say. “We are facing the largest forced migration crisis since World War II,” said study leader Adam Kushner from Johns Hopkins Bloomberg School of Public Health in Baltimore. “And while surgery is a critical component of health care, it is often neglected in times of crisis,” Kushner noted. Without access to timely and safe surgery, many people will become disabled and many will die — outcomes that could have been prevented, Kushner pointed out. 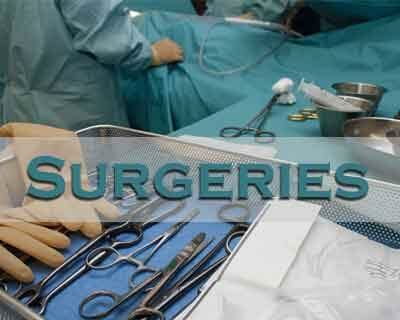 The researchers said that the findings, published online in the World Journal of Surgery, shed light on something that few governments and humanitarian aid organisations plan for when preparing for a large influx of displaced persons who are far from home and often in countries where there are already great unmet needs for surgical procedures. “When planning to take care of refugees, much thought is put into how to house and feed and clothe people who are far from home for circumstances often beyond their control,” Kushner said. “But surgery is a basic need and nobody talks about this,” Kushner noted. The types of necessary surgeries run the gamut, from the repair of hernias and broken limbs, to C-sections and cleft lips and gallbladder removals, even stitches and burn care – any type of procedure that would be needed in any other population. For their study, the researchers collected data from the United Nations High Commissioner for Refugees (UNHCR) and the United Nations Relief and Works Agency for Palestine Refugees in the Near East on the number of refugees, internally displaced persons and asylum seekers around the world and on their demographics. To estimate the number of procedures needed per year, they used a previously published minimum of 4,669 annual procedures per 100,000 population. While many refugees live in camp settlements, more than half live in established communities, yet they are typically precluded from accessing essential surgery due to a lack of proper documentation, high costs or weak surgical infrastructure in their host country, the study said.